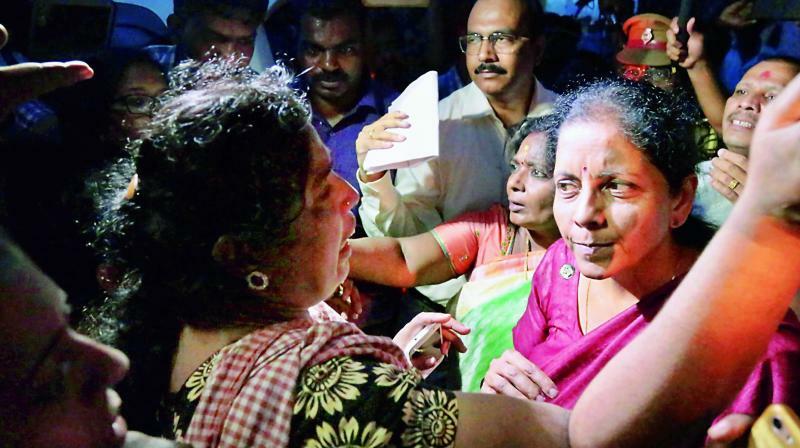 Udupi: The Navy has made every effort to search for seven fishermen aboard the fishing boat ‘Suvarna Tribhuja’ which went missing off Malpe in Udupi since December 15 last, Defence Minister Nirmala Sitharaman said Tuesday. She said so far, there was not much knowledge on what could have happened to the boat. As the model code of conduct is in force, suggestions are being taken from the kin of fishermen as the issue cannot be discussed openly now, she said. “I have told the family members to approach the defence ministry and discuss the issue with the officials concerned,” the minister said. On the JD(S)-Congress alliance candidate Pramod Madhwaraj’s charge that the Navy had not conducted a proper search operation for the missing fishermen, she said politicising the issue is regrettable. “Those raising such allegations on a sensitive matter like this should produce proof for the same. Responsible persons should desist from raising baseless charges which can vitiate the atmosphere,” she said. Earlier, she attended a meeting of fishermen at the Country Inn in Manipal. She did not elaborate on the issues discussed at the meeting. The minister later attended the ‘Vijay Sankalp’ gathering organised at the BJP office in Kunjibettu. She also accompanied sitting MP Shobha Karandlaje to the deputy Commissioner’s office to file her nomination papers from the Udupi-Chikkamagaluru constituency, seeking a second term.